In the early spring of every year, Japan enters one of its most precious seasons, the cherry blossom season. Cherry blossoms, known as “sakura” in Japan, are the country’s most beloved flower and a national symbol. Sakura trees are only in bloom for a few short weeks, which end in a dramatic shower of petals like falling snow. These petals and blossoms, along with the sakura tree’s leaves, can actually be used in Japanese cuisine for a number of traditional desserts. 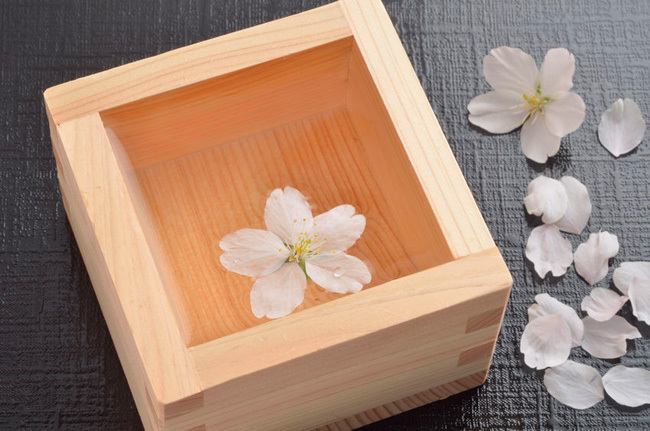 Fresh sakura petals don’t have much flavor, but when they are freeze-dried or pickled in vinegar then salted, the aroma and flavor of the flower becomes concentrated and can be used to flavor various dishes and drinks. 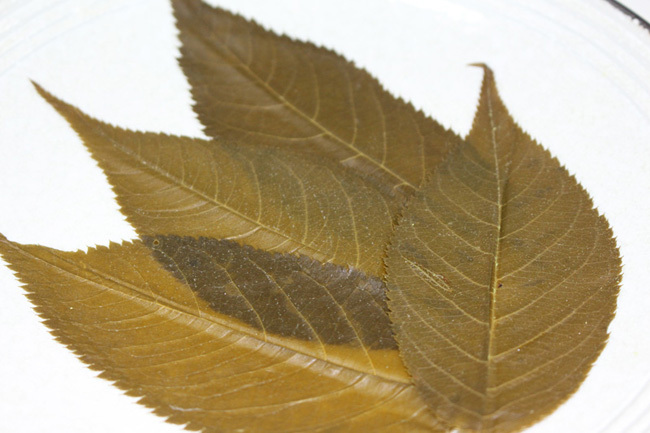 The leaves can also be pickled and salted or dried and ground into a powder and used in a variety of desserts. 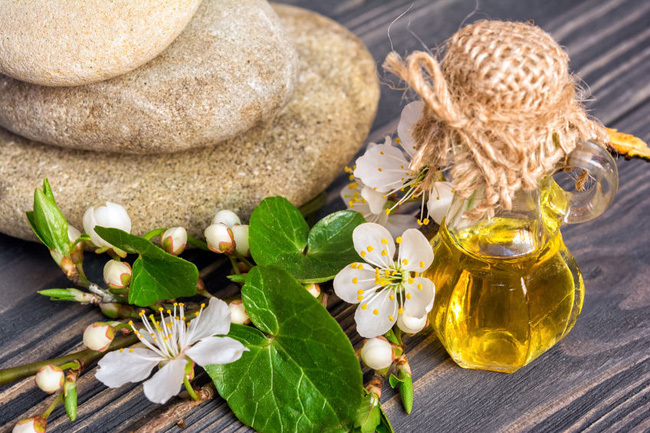 Read on to discover the many different ways in which the petals and leaves of the Japanese cherry tree can be used to create sakura food and drinks. 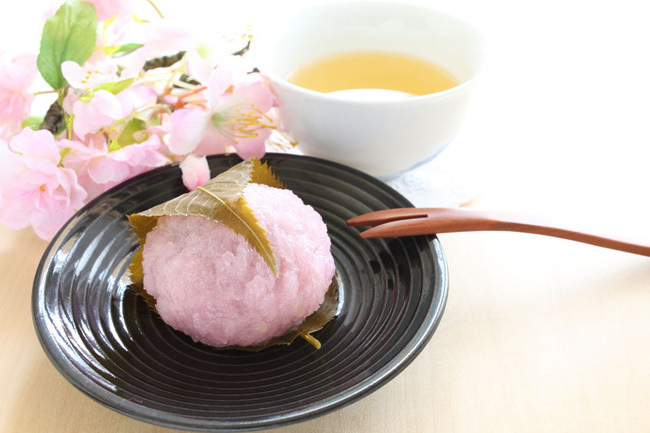 Sakura mochi is a traditional “wagashi”, or Japanese sweet, that’s enjoyed during the springtime in Japan’s eastern Kanto region. 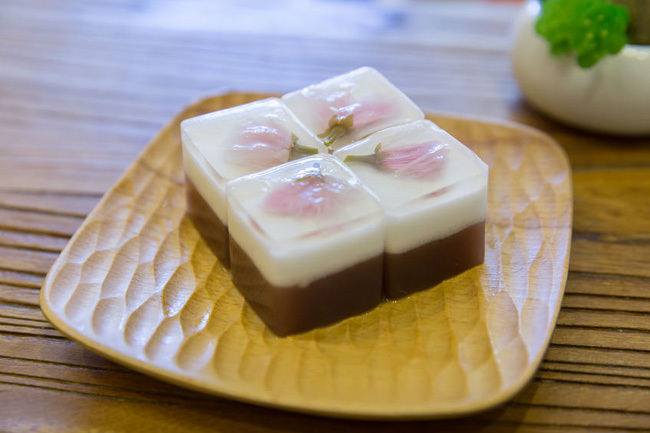 It’s made by folding a piece of mochi rice cake around red bean paste and then wrapping that in a salted cherry blossom leaf, which provides a tart contrast to the delicate sweetness of the rice cake. 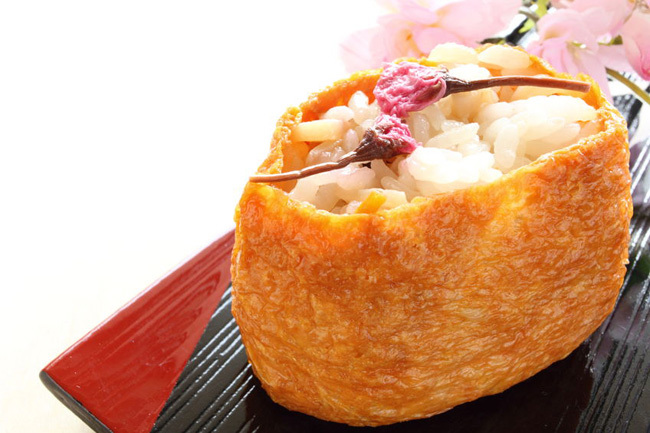 This treat is often eaten as part of Japan’s Hinamatsuri (Girls Day) festivities. Domyouji is a similar wagashi treat from Japan’s western Kansai region that’s wrapped in a salted sakura leaf for a sweet and salty flavor. Rather than a smooth mochi rice cake, however, it’s made with glutinous rice that has been pounded into a lumpy paste with some grains left partially intact. Try rice balls made with sakura for a savory treat that’s perfect to take on a picnic. 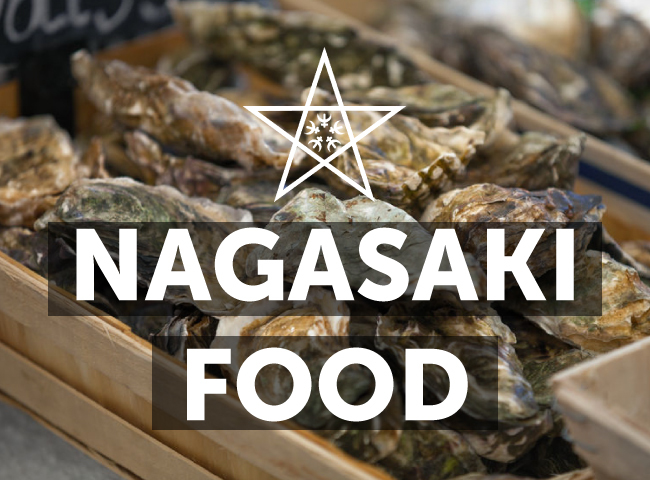 They’re made by soaking salted cherry blossoms in water and then cooking short grain Japanese rice together with the reconstituted flowers and some of the sakura steeping liquid. 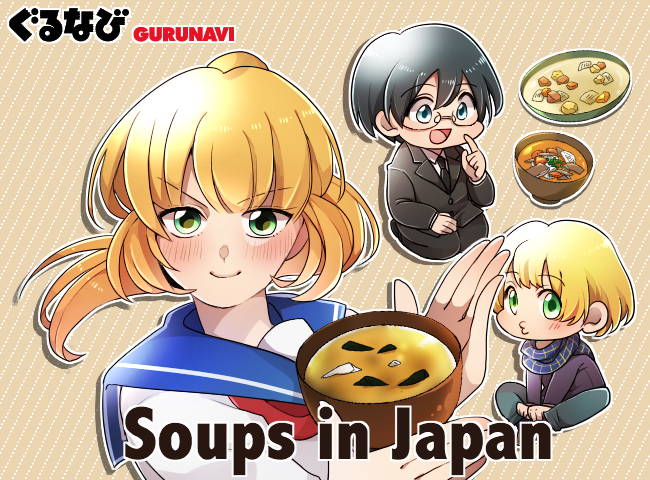 The cooked rice will have a slightly salty flavor from the steeping liquid, and the rice balls can be molded into any number of shapes, from the traditional onigiri triangle or round rice ball shape, to fun shapes made with plastic onigiri molds. 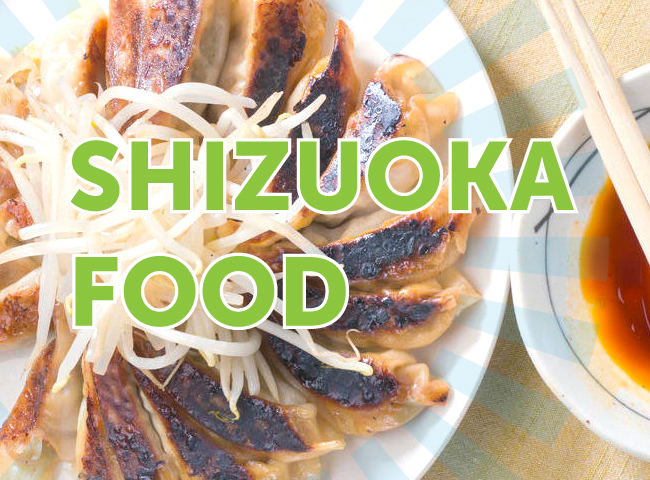 The rice mixture can also be used as a filling for inari-zushi, sweetened deep-fried tofu pockets. 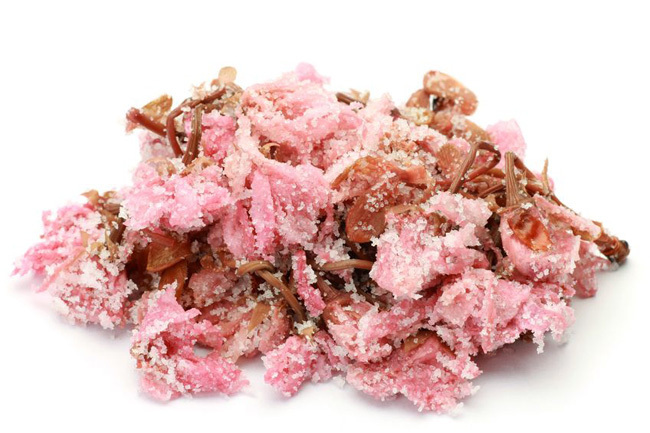 Sakura-an is a Japanese sweet made with shiro-an (sweetened white bean paste) mixed with chopped salted sakura leaves. 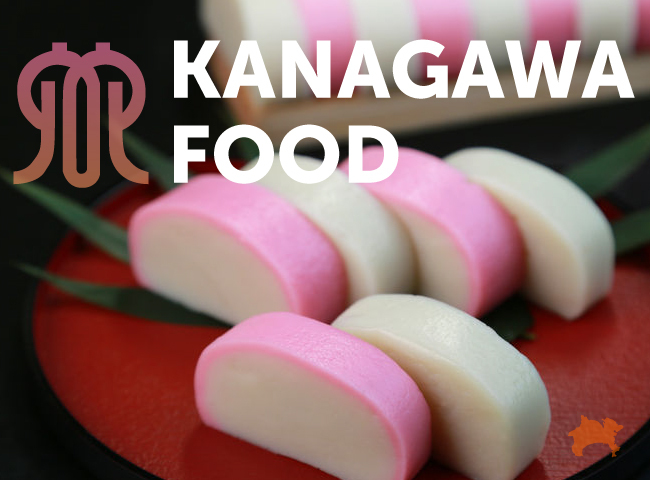 Food coloring is usually added to give the white bean paste it's pale pink color that’s reminiscent of cherry blossoms. Shiro-an can be used to make traditional wagashi cakes or as a condiment in desserts like Japanese-style parfaits. Yokan is a traditional jellied dessert made with native Japanese ingredients. To create sakura yokan, a unique type of type cherry blossom food, sakura-an bean paste is strained until the texture becomes perfectly smooth, then mixed with kanten (also known as “agar agar”), a gelatin agent that comes from seaweed. The clear gelatin mixed with the thick paste of the sakura-an creates a distinct texture, which can be molded into the shape of a block. Sakura kanten is similar to yokan jellied sweets, but is made with clear or translucent gelatin. 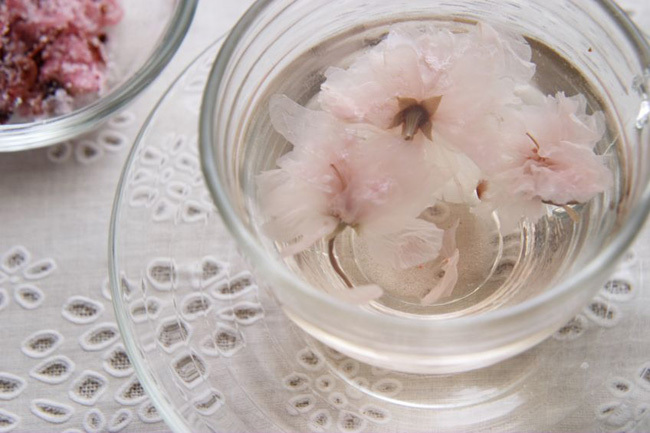 Sakura petals may be embedded within the jelly, creating a visually striking cherry blossom dessert. 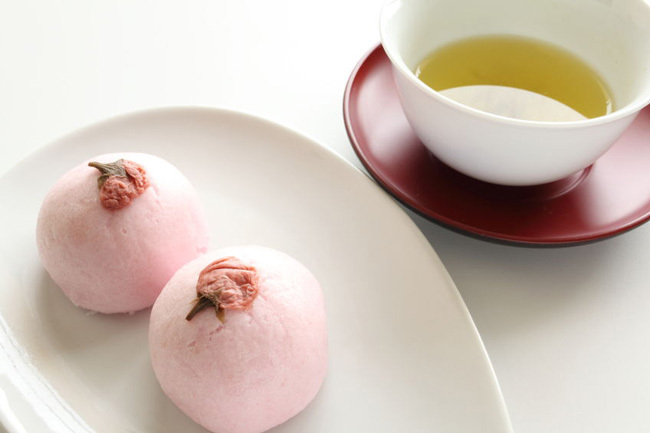 Sakura manju is a wagashi pastry made of steamed dough that’s filled with sweet bean paste. 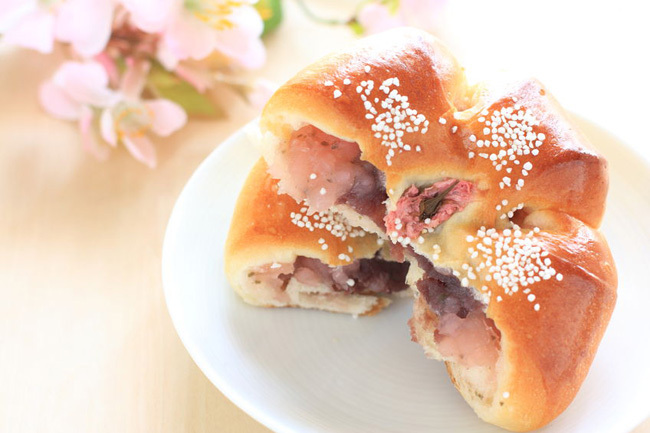 The bean paste may be mixed with chopped salted sakura leaves and petals, while the flour-based dough may be white or colored pink and garnished with a sakura blossom. 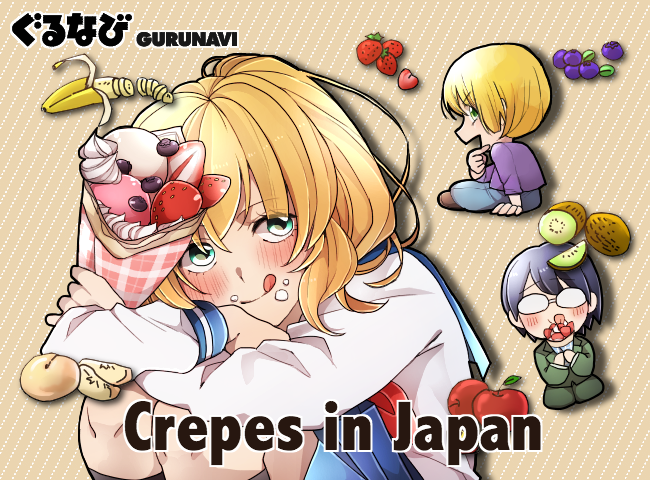 Although not a traditional Japanese sweet, macarons are a French confectionery that has become popular in Japan. Macarons feature buttercream, jam, or richly flavored ganache sandwiched between two meringue-like cookies. 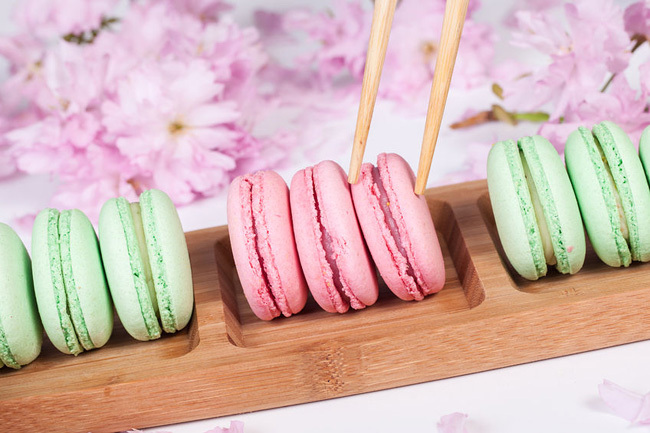 Sakura macarons can be made by topping the macaron with a salted sakura flower, infusing cream with sakura blossoms to make a sakura buttercream, or using sakura tea to make the ganache. 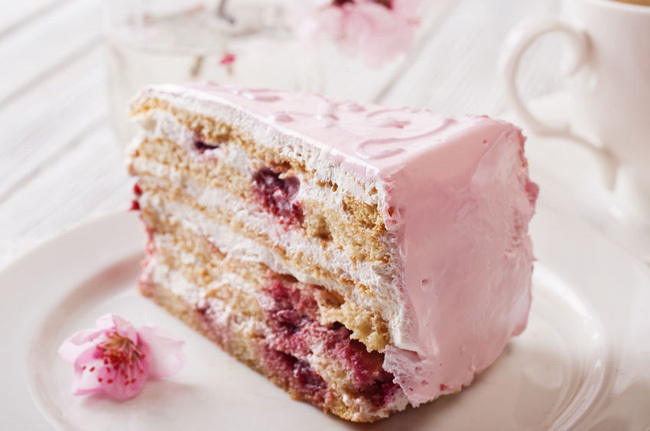 Delicate Western-style cakes such as shortcake and roll cakes made which fresh whipped cream are also highly popular in Japan. During the springtime, some Japanese bakeries offer seasonal sakura cakes, made with chopped salted sakura petals baked into the cake batter or sakura flowers infused in the whipped cream for a light floral flavor. 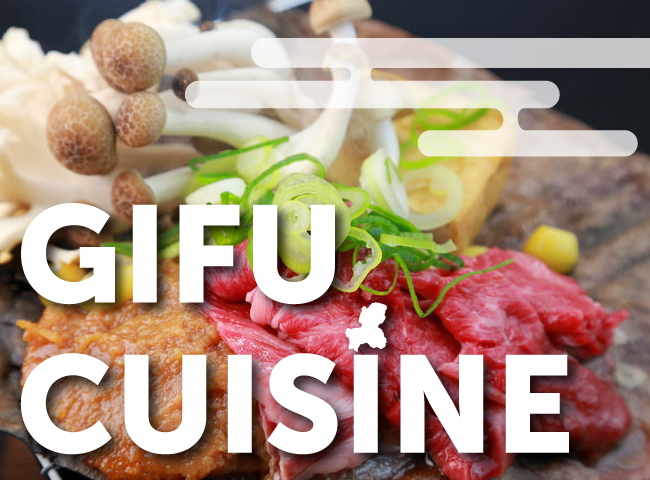 A truly enchanting cherry blossom food. Senbei are a type of savory rice cracker toasted over a flame. 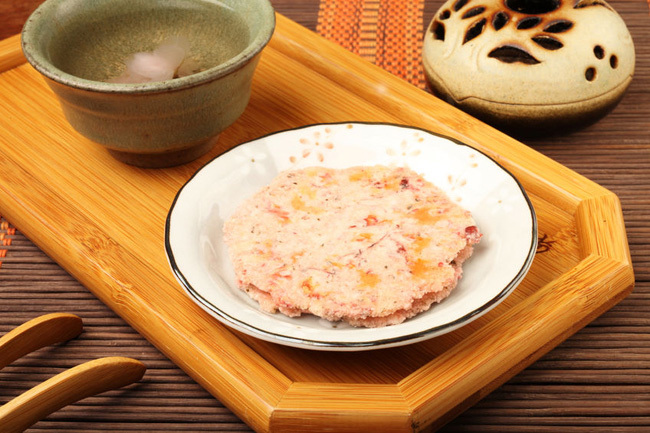 For a limited time in cherry blossom season in Japan, some artisan senbei makers sell a sakura-flavored senbei with salted sakura leaves or blossoms mixed into the toasted rice cracker. The cherry blossom aroma becomes magnified when the cracker is toasted. During cherry blossom season, it’s common to hold a “hanami” (cherry blossoming viewing) picnic under the sakura trees and enjoy a glass of sake. Some sake manufacturers take this as an opportunity to release limited springtime varieties of sakura-flavored sake. 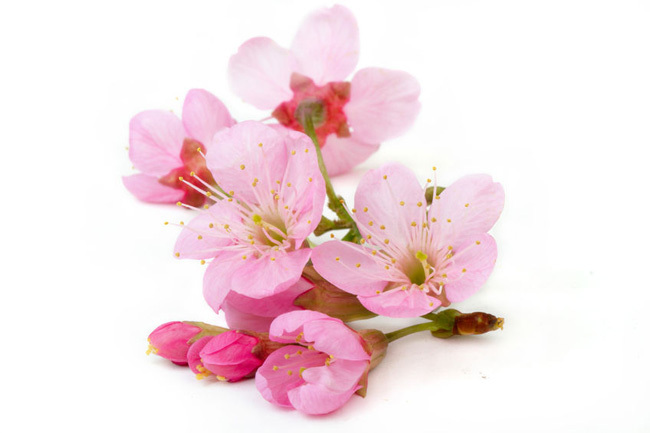 Although the flavor is quite delicate, the sakura aroma and taste are unmistakeable. There are two main ways to enjoy sakura in tea. One is sakura tea, made with a blend of premium sencha green tea and dried sakura petals. 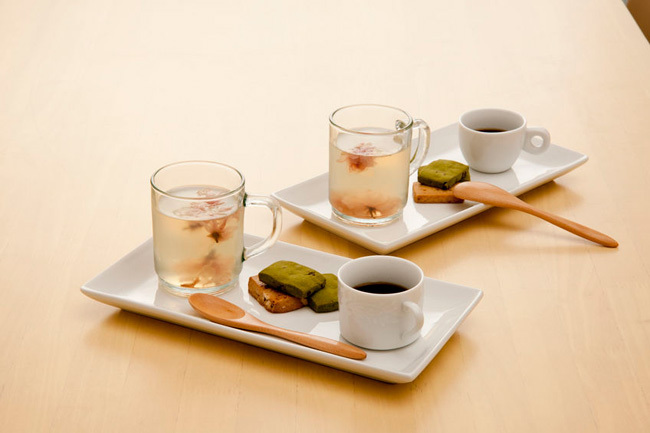 The other option is sakura-yu, a hot beverage made with pickled cherry blossoms that are dried and salted, then steeped in hot water for a slightly salty but delicately floral tea. A delicious sakura latte can be made at home by mixing sakura tea with hot milk for a floral tea latte. Try frothing hot milk to make the latte extra creamy. 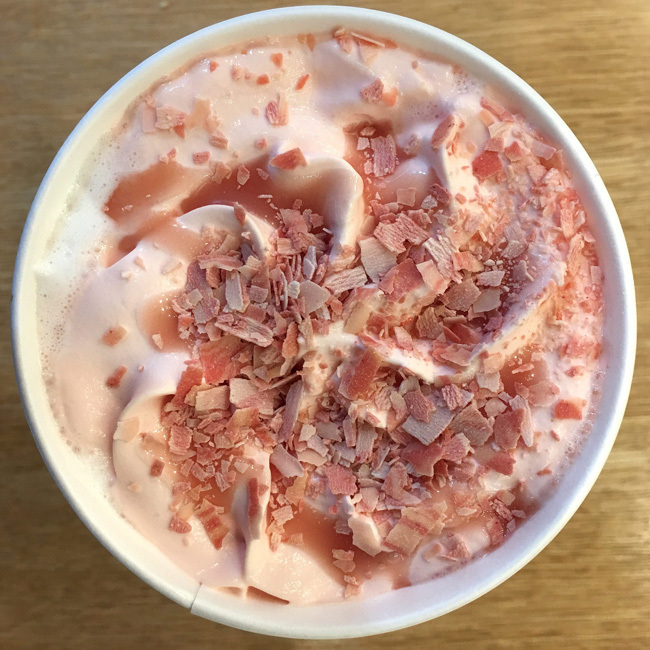 In addition, several coffee and tea chains in Japan offer a sakura latte during the spring with salted cherry blossoms and petals mixed into the drink for a sweet and salty beverage. In Japan, cherry blossoms are a symbol of the fleeting nature of life, as the brief window during which the sakura come into bloom can only be enjoyed for a few short weeks each year. 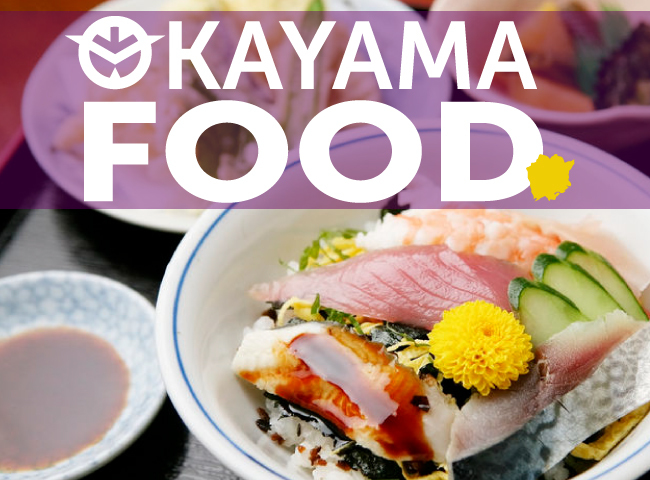 As you sit beneath the falling petals, why not enjoy cherry blossom season with some sakura food and drinks?